Chances are you've visited a marine protected area and maybe didn't even know it. If you've gone fishing in central California, diving in the Florida Keys, camping in Acadia, swimming in Cape Cod, snorkeling in the Virgin Islands, birding in a Gulf Coast wetland, hiking along the Olympic Coast, or boating in Thunder Bay, you've probably been one of thousands of visitors to a marine protected area (MPA). 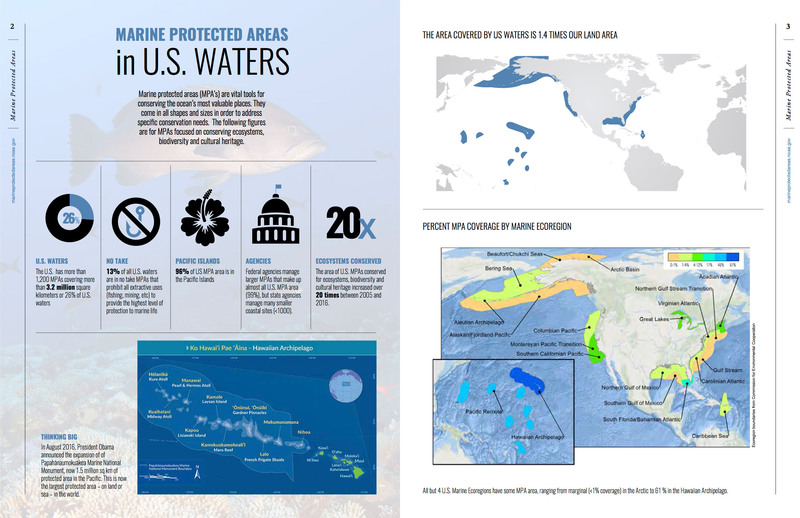 Learn about the many types of MPAs in U.S. waters in this new magazine – including an infographic summarizing key facts and case studies of key issues facing MPA managers. "Marine protected area" is a broad term for a park or other protected area that includes some marine or Great Lakes area. Executive Order 13158 defines an MPA as: "...any area of the marine environment that has been reserved by federal, state, territorial, tribal, or local laws or regulations to provide lasting protection for part or all of the natural and cultural resources therein." Detailed definitions of these terms are outlined in the National System Framework. What kinds of MPAs are there? The National Marine Protected Areas Center has developed a Classification System that describes MPAs in functional terms using five characteristics common to most MPAs: 1) conservation focus; 2) level of protection; 3) permanence of protection; 4) constancy of protection; and 5) ecological scale of protection. A marine reserve or "no take" MPA is a highly protected type of MPA where removing or destroying natural or cultural resources is prohibited. Marine reserves are rare in the United States, with about 3 percent of U.S. waters in these no-take areas. Reserves protect whole ecosystems, allowing them to return toward a more natural and balanced state. Monitoring studies from marine reserves have shown that biomass, the size and density of organisms and the richness or diversity of species all increase within marine reserves. Reserves can be an effective way to preserve biodiversity by protecting communities and providing refuge for rare organisms. 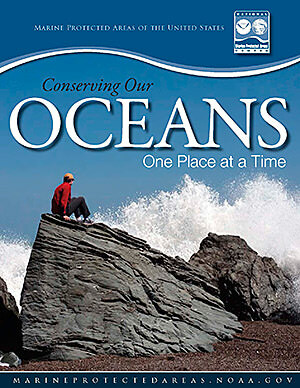 Find out how you can help our oceans and marine protected areas.